Our ebook has met a warm reception, we held a workshop event recently, and we're getting ready for USENIX LISA this week. Last week's ebook received a tremendous response and the number of downloads has been staggering! We also spent time on Reddit discussing the ebook and answering the questions and comments of readers. We also received a mention in Chris Short's DevOpsish newsletter which you should checkout for quality DevOps links every Sunday. If you haven't had a chance to read the ebook yet, download it now. It's completely free. No forms to fill out, not even your email address! Recently we put on our AWS Serverless Up and Running workshop hosted at the AWS Boston office. 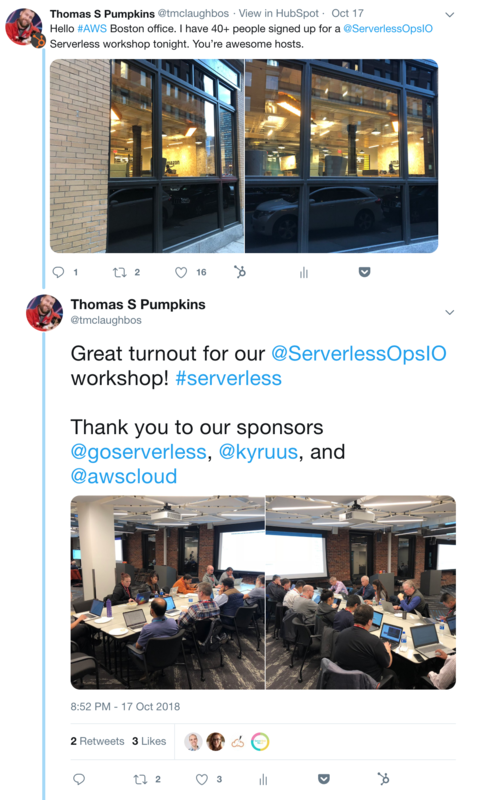 We had a fantastic turnout and very thankful for our sponsors Serverless, Inc and Kyruus. Interested in hosting a training at your event or employer? Then contact us. We'll be at USENIX LISA this week. Our workshop is on Tuesday morning at 11:00am. We'll also putting finishing touches on our closing keynote. If you're attending, reach out to say hi. We'd love to meet. Do you like long and comprehensive ebooks on serverless? Of course you do! Make sure you pickup this one from The New Stack after you read ours. Thundra went general availability last week. Make sure you check it out as you evaluate your observability needs. Jeremy Daly, the #2 serverless thought leader in New England (#1 is Ben Kehoe), was on the JS Party podcast chatting serverless. You need to give it a listen. This academic paper delves into using AWS Lambda for scaling linear algebra calculations. Building an elastic machine learning architecture on AWS Lambda. Feel like so much is happening in the AWS serverless world? Catch this write up of all that has in the past few months. Join Forrest Brazeal of Trek10 for this webinar on enterprise serverless workflows. It's sure to be a great tech talk between him and To Be Announced, an expert at AWS. And congratulations to you if you recognized the song we parodied because you enjoy 80s German electronic synthpop!